In the beginning, before there were any settlements here, when this place now known as Puerto Vallarta was only a mule-convoy stopover for the transfer of goods among the region’s hamlets, this place was referred to as Las Peñas. 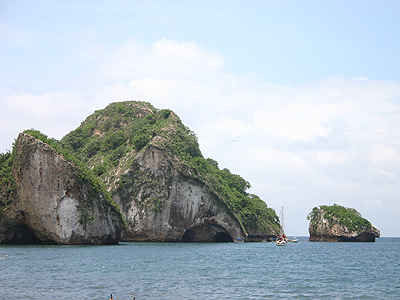 Las Peñas, The Rocks, refer to the rock formations right next to the lush cove of Mismaloya Beach. It was there that John Huston chose to film, in the early sixties, Tennessee Williams’ “The Night of the Iguana”. The glamour of this port was further enhanced by the extra-marital romance between Liz Taylor, not part of the cast, and Richard Burton. 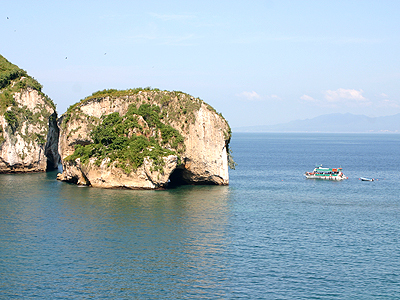 The movie and the affair surely contributed to put Vallarta on the map. But Los Arcos has a different meaning from Las Peñas. Los Arcos means “The Arches”, because for some reason, nature decided to allow water to flow freely through three of the enormous boulders just off the coast, creating a natural treasure: where snorkelers can swim through all three arches, among multicolored fish that seem to enjoy sharing the transparent, warm waters and the rock and coral formations with those of us who daringly of meekly accept their hospitality. I sometimes dive in with a banana from the breakfast buffet offered on board; those little guys in yellow and black scales just love bananas, could it be color affinity? I don’t know, but after a while they are your friends. And they make colorful scenery, if you have a waterproof camera, they are willing to pose, banana provided. The place is also ideal for scuba divers, with its wide array of depths beginners can train in the shallow areas from a few feet deep, to the main platform about 20 feet deep. Experienced divers can swim all around the arches or explore a 300 feet deep canyon called “La Quijada del Diablo” (The Devil’s Jaw) continuing to a drop just shy of a mile! I would say that the best way to enjoy Los Arcos is either renting your own “panga” (open boat for 6 to 8 persons) in Mismaloya; or joining one of the bay cruises stopping there; there are about ten of them and they all carry snorkeling gear free of charge; anyone who does not want to get wet can enjoy the wonderful sights of thick, impenetrable mainland jungle vegetation, or that of young pelicans rocking on the branches of the trees at Los Arcos, undecided as to making their inaugural flight or waiting to be fed by mom and dad. Los Arcos was declared a protected area back in 1975 and, although those laws have changed through the years, the local navy and maritime authorities still protect them as such even when a new decree has not yet been issued. Of course no fishing or anchoring is allowed in or around Los Arcos to protect its natural environment. 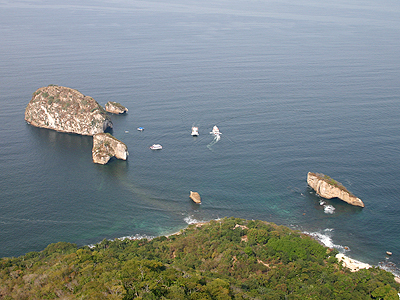 There are several boats cruising the bay daily and stopping at Los Arcos to sightsee, swim, snorkel and scuba dive. Most will continue to the beaches further south that can only be reached by boat to enjoy the sand the surf and the sun. This makes cruising the bay a magic “get away from it all” experience. There is the sandy beach of Las Animas; under its palapas (thatch huts) you can enjoy a tropical drink and savor the taste of fresh seafood; there are also water sports available like jet-ski rentals and parachute and banana rides. There is also Quimixto, where you can rent a horse or hike across jungle paths to the waterfall hidden in the middle of the jungle. Further south lies Majahuita, a beautiful sandy beach flanked by palm trees and jungle offering a few very nice and scenic bungalows for rent with great views of paradise. Area: The Protected area covers a surface of 30 Hectares. 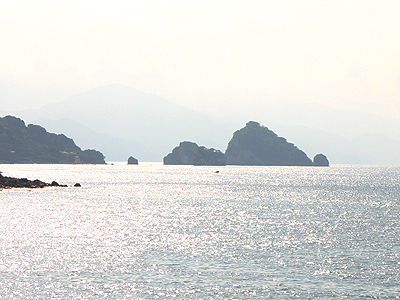 Islets: 5 islets; with heights of 15 to 150 ft.; three of them featuring natural arches. Water Temperature: Lowest 18ºC (65F), in winter; highest 35ºC (95F), in summer. Coral Species Found: Ten species from genders Psammocora, Pocillopora, Porites and Pavona. Recommendations: Take pictures, not samples. Avoid direct contact with the rock and coral formations; they can result in injuries to human beings and coral communities alike. I thank Professor Amílcar Cupul of the Universidad de Guadalajara, for his counsel on the theme of Los Arcos.